With Disney partnering with Marvel Studios, we have a newfound love of all things Marvel, including Captain America! We’d love to sail on Disney Cruise Line’s Marvel Day at Sea. 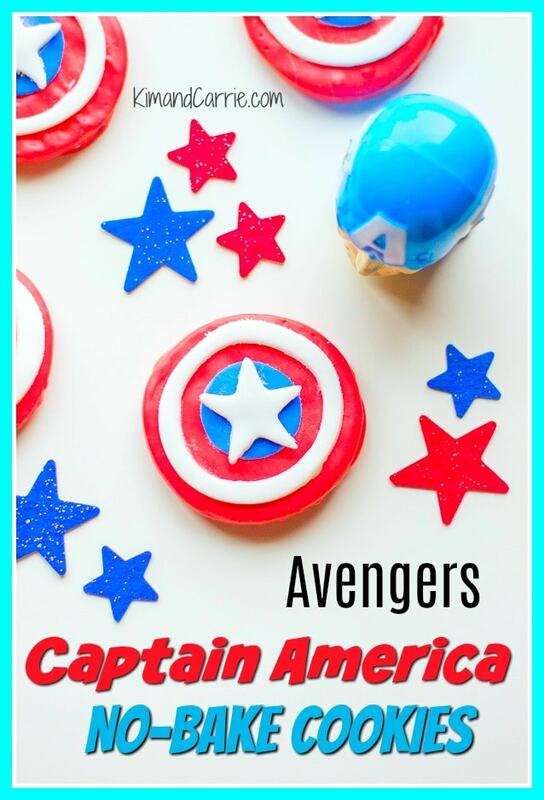 Until then, we’ll shop at the Marvel Studios store at Disney Springs and we’ll create our own fun party at home with these kid-friendly cookies that are perfect for superhero-loving adults, too! These red, white and blue cookies are also perfect for Memorial Day or the Fourth of July. So be sure to bookmark (or Pin) this patriotic no bake cookie recipe to enjoy all summer! One of our favorite ways to make fun snacks is to use as many pre-made ingredients as possible. Neither one of us has any time to be baking from scratch these days. Though we would love to! So for those weeks when it seems you’re running back and forth between sporting practices, errands, shopping and every other demand on your life, it’s nice to know that you can buy pre-made sugar cookies and still make fun treats that look homemade! 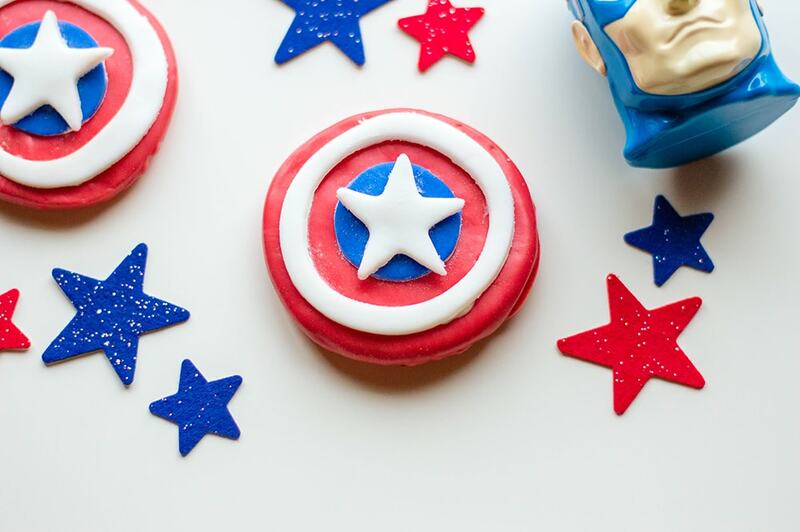 These cookies are ideal for an Avengers party or Marvel Studios party. You can make this recipe without heating up the oven. And you’ll look like a superhero! 1. Line a baking sheet with wax paper. 2. 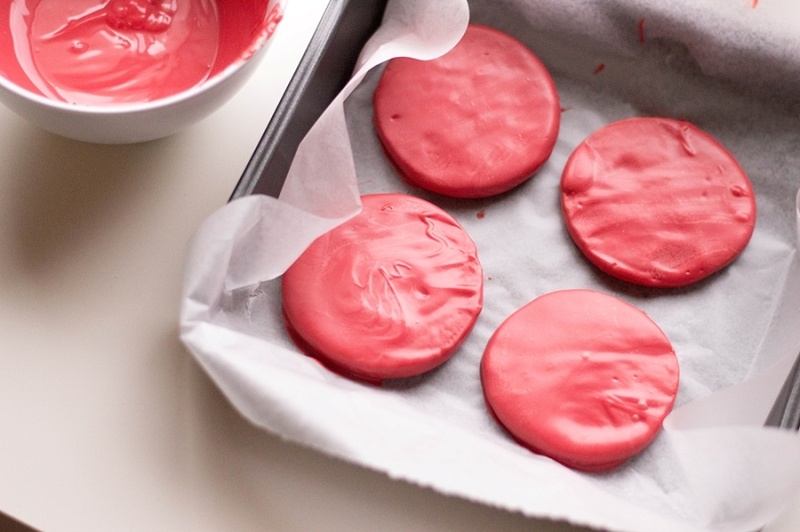 Microwave your red candy melts and coconut oil in 30-second intervals until completely melted. Mix thoroughly. 3. Dip each sugar cookie into the melted candy. Make sure that the tops of each cookie are fully covered with red candy. Set carefully on lined baking sheet. Allow to set in the refrigerator for about one hour. 4. Dust a clean working surface with cornstarch and start rolling out your fondant. Cut your white fondant with the largest cookie cutter (2 inch) and then using the 1.5 inch cookie cutter, cut a hole in the middle of it. 5. 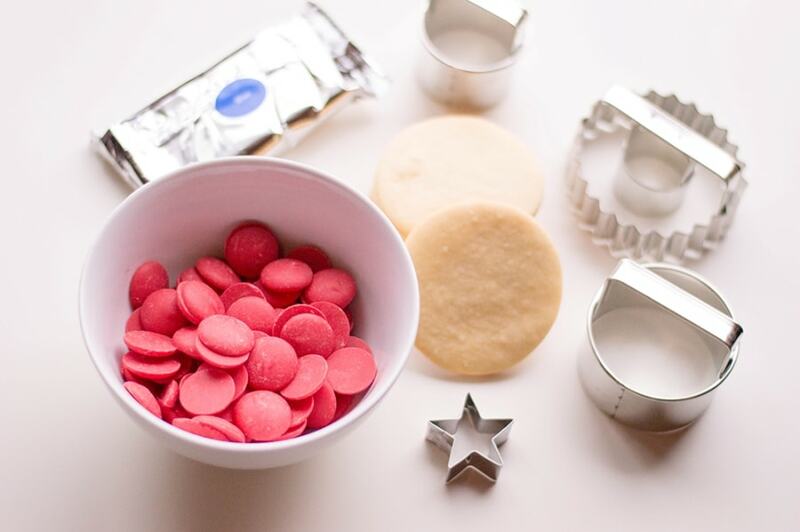 Using your smallest circular cookie cutter, cut out blue fondant circles. 6. Cut star shapes from the white fondant (you can cut the stars from the leftover circles that remain after step four). Use buttercream to “glue” it onto your blue fondant circles. 7. 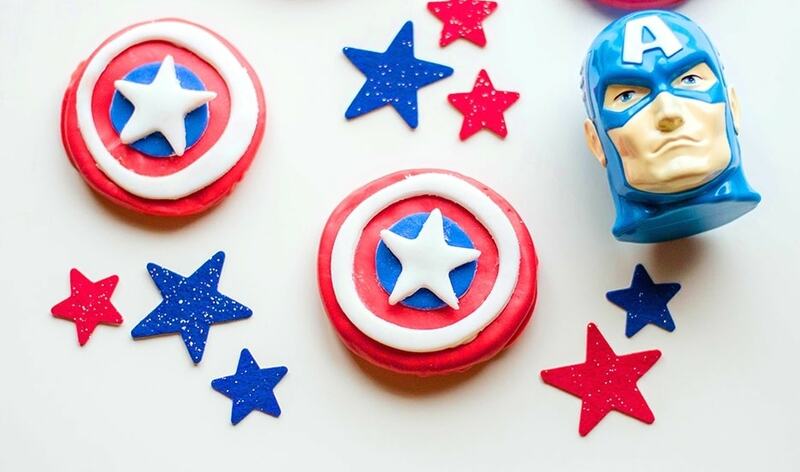 Once the red candy coated cookies are set, remove them fridge and start assembling Captain America’s shield. Using your buttercream as the “glue,” first place your large white circle, then the blue one (with the star). Have you seen the Official Trailer for Marvel Studios’ Avengers: Infinity War? Here it is!